At temperature higher than -120F (-110C) concrete shows small increase in strength. Development of strength depends on ambient temperature of concrete. The datum temperature of concrete is -120F. Now can concrete be exposed to cryogenic temperature? We will find answer of this question later, at first, we will learn about cryogenic temperature. There have no well-defined point in temperature scale where refrigeration ends. Cryogenic begins when refrigeration ends, it is assumed that it begins ≤ -2380F (1500C). When concrete storage tank is used to contain liquefied natural gas (LNG), concrete is exposed to cryogenic temperature. The boiling point of LNG is -2600F (-1620C). When ambient temperature of concrete drop down from freezing point (water) to about -3300F (-2000C), the strength of it found significantly higher than that kept in room temperature. Compressive strength may be several times more than strength of concrete in room temperature. But moisture content is the main varying factor. The compressive strength is often found (2~3) times of the strength at room temperature when concrete is in moist condition while it is being chilled, but in case of air dried concrete this increase is found much less. So there has difference between strength of dry and wet concrete; this is due to ice formation in hydrated cement paste. Again freezing point of water in gel depends on pore size; the smaller the pore the lower freezing point of water. The usual range at which all water adsorbed in pore become frozen lies between -1120~1390F (-800~950C). Unlike water, ice formed in pores with in gel has resistance against stress and frozen concrete shows extremely low apparent porosity. low We know low porosity offer higher strength and greater durability (though later one is not true here). Again compressive strength of such concrete (actually ice) depends on temperature. Temperature also controls thermal expansion of ice. Thus behavior of hydrated cement paste is very complex. If ambient temperature of concrete is not very low, the porosity of concrete would be low and strength increase would be found very low. Above figure shows that temperature below -1200C compressive strength increases very small. This is due to reaching a region of temperature scale where internal structure of the ice in pores is changed. Actually at -1130C the hexagonal structure of ice takes forms of orthorhombic structure. Volume decease of around 20 percent is usually accompanied by this change in structure. So, cyclic variation of temperature around concrete has to be investigated carefully as temperature gradient is very important in structural design, especially, at this range of temperature. Now let’s consider tensile strength of concrete in cryogenic temperature. Tensile strength is important as liquid gas obviously produce pressure on cryogenic tank. Regarding tensile strength, it can be conclude that the behavior of concrete is not identical as that in compressive strength; there have also an increase in tensile strength but in compared to compressive strength it is smaller. Following figure shows variation of tensile strength with temperature. Above two figures correspond to lightweight aggregate concrete; this type of concrete is considered as cryogenic tank need good insulation properties of concrete. xxxxForm figure we can conclude that tensile strength increase within limit of -70 and -870C. Now consider normal concrete, the increase in strength is more pronounced at low temperature than that of lightweight. When moisture content is considered, the related term w/c ratio has to be investigated, it is very interesting to notice that compressive strength increase with moisture content is not related to water/cement ration. 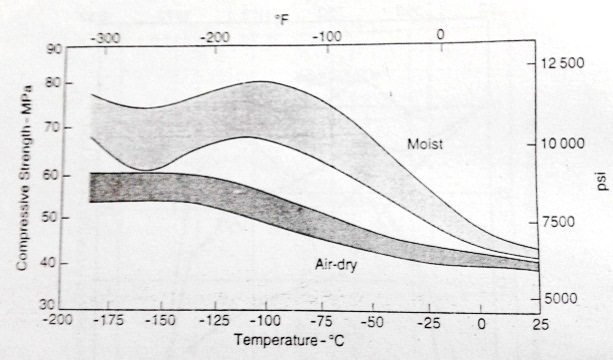 Modulus of elasticity of concrete both in moist and air-dry concrete are also changed with temperature change. This parameter of moist concrete shows a steady increase with temperature decrease till -1900C. 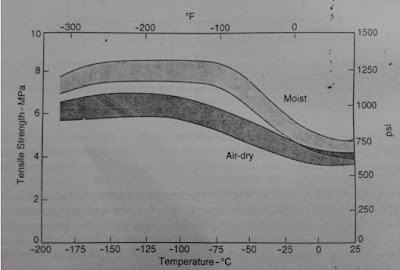 At this temperature air-dry concrete has modulus of elasticity around 1.65 times that corresponds to room temperature; for moist concrete the value is about 1.75.